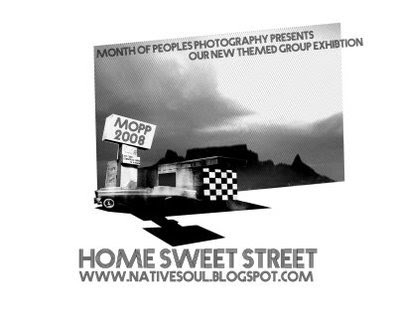 This year, being geographically indisposed, I decided to create an on-line exhibition around the theme of 'Home Sweet Street'. 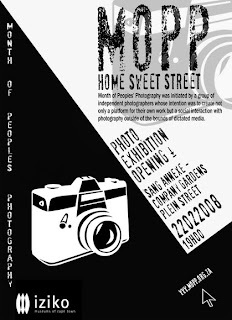 Dubbed 'One Long Street', a title intended to be taken literally but referencing the famous Cape Town street at the same time, the series collected together street photographs from various locations taken from a head-on angle. I made minute adjustments and played with different orderings of the photos so that the lines and 'street level' of one would flow smoothly into the next. Placed side-by-side (after having discarded the idea of one long composite photomontage), they give the impression of a world connected by its lowest common denominator - the street. 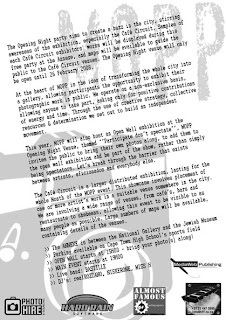 The choice of a web medium for this series was a prescient one, as it probably got a wider exposure than it would have as a print exhibition. As reviewer Miles Keylock mused, the images "flatten the West’s global hegemony with images of Cape Town, Nagoya, Fes, Lisbon and other great urban centres of the world." Read the full review at the AvantAfro blog. The actual site was linked off the main MOPP page and is now archived here. Some say the street is the stage for the drama of life. I prefer to think of it as the spectator. To the eyes of the doors & windows, to the ears of the lampposts & beaten pavement, through the dark alleys & gutters of dust & trash, nothing passes unnoticed. The camera is also complicit in this gesture, which is universal across urban cultures. In the street can happen everything, and nothing in particular. These photos are snapshots of the latter, scenes in which life simply goes on until the next corner. Posted by the blind camera at 1:23 a.m.